Christmas, a time for giving, but there are people who give all their lives not just around the holidays, they are usually those that teach. Mary Beth Miller Klein, should have the Highland Highlights by-line for this month. You will see from her story how one person, a teacher of dance, can affect the lives of all they touch. Mary Beth, twice a World Champion shares her love of the dance and her great respect for all things Highland especially her great love and admiration for a very special person in her life, Sheila Mittig. "August is the month that celebrates the Cowal Highland Games. Where every dancer dreams of becoming a Cowal Champion, and every teacher hopes their student's dreams will become reality. When I think of these Champions, the first thought that comes to mind is that of extreme commitment. Not just on the part of the dancer, but also from their parents and teacher. If a dancer lacks the commitment and determination, dreams are just dreams. However, if it were not for the sacrifices and support from their parents and teachers, dancers could never realize the dream in the first place. It is because of these special people in my life that I write this article in hopes of sharing my love and gratitude. As many dancers have experienced your teacher becomes your mentor, friend, and if that wasn't enough . . . your second mother. I have been very fortunate through the years of taking lessons with some of the best teachers in the world, and owe each of them a depth of gratitude. It takes a teacher with special qualities to reach inside your heart and pull out that internal desire. For me it was none other than Sheila Mittig. Sheila was born in Balloch, Scotland to parents Jack and Bunty McMillian. Her grandfather (Sam Morgan) and mother were also highland dancers, so when Sheila started dancing she got plenty of encouragement from that direction. Sheila began dancing at the age of four with Ms. Jessie Stewart Haggerty. At that time (as it still is) dancers were encouraged to participate in all forms of dance. Sheila studied ballet, modern, ballroom, and stage. Her brother Billy McMillian told me, "If my dad was working I was dragged along to the lessons (no baby sitters in those days), but I always thought Highland was her forte. She was good at the rest but Highland was the one." 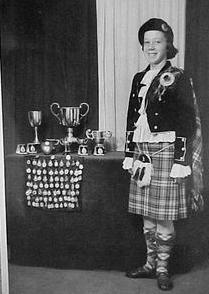 Sheila first began teaching in Balloch around the age of seventeen or eighteen. After visiting the United States in her early 20's, she made the decision to leave Scotland and move to Detroit in 1964 to live with her Aunt & Uncle. If you were to ask how Sheila how her teaching history began, she would give all the credit to Mrs. Margaret Killen. Mrs. Killen encouraged Sheila to become involved in the US and introduced her to the dancing community. It was also through Mrs. Killen that Sheila was introduced to piper Sandy MacPhee. Sandy played for Sheila at many performances and said, "She was one of the best dancers I had seen in a long time." It was Sandy that introduced Sheila to her husband, walked her down the aisle, and led to her first student, Diane MacPhee. While teaching in her Aunt & Uncle's basement, Sheila's outstanding reputation as a teacher began. As more and more dancers heard of Sheila, her school and reputation grew. Other students during this time included Gail Watson, Beth Noble, Donna MacPhee, Zoe and Norine Keros. It was at a competition venue in 1970, I began talking to another dancer by a Coke machine. Little did I know that this friendly encounter would influence my dancing, for it was the through Diane & Donna MacPhee and their parents that we first heard about Sheila Mittig. In 1971, Sheila and her husband moved from Detroit to Illinois. My parents saw an ad Sheila had placed in Highlander Magazine and they immediately contacted her to inquire about lessons. Learning I would be traveling from Kansas City to Illinois for lessons only once a month, Sheila was doubtful the arrangement would work out. With no expectations other than to see if we got along, I flew to Chicago for my first lesson. From the very beginning Tom & Sheila Mittig opened their doors and hearts not only to me, but to my whole family. Within months our families became one. Once a month I would fly to Illinois for weekend lessons and stay with my new "extended family," and once a month they would have to carry my sore and aching limbs back to the airport. It was a recurrent joke between Tom and me if he would have to get a wheelchair. At the time I thought there must be something special about our family, when in fact it was Tom & Sheila who were the special and unique people. From that day forward I remained her student as she relocated from Illinois to Colorado and then back to Detroit. No matter the distance, my parents knew as I did that a perfect match had been found. Taking lessons from Sheila Mittig was an enchanting experience. I was in awe of her, adored her, and thrived to please her. It amazed me how she knew my internal thoughts. She was like an expert mechanic oiling all the wheels turning in my head. When those gears would stick, she knew the exact words to lubricate them and take them to their full potential. The thought of disappointing her was unimaginable. Then again disappointing Sheila was impossible as long as you gave 100%. She taught you to love to dance and to dance from the heart. The only way a person can teach this aspect of dance, is to possess it themselves. Sheila had that and more. As a teacher you can only hope to have this type of effect on some of your students, but it seems she had this effect on all of her students even from the very beginning. 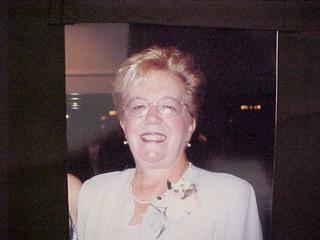 Diane Krugh informed me, "Sheila was very strict and always demanded 110%. She always expected our best, and didn't accept anything less. It was because of this, that she had one of the best schools in Detroit." Teaching your own child is probably one the worst nightmares a teacher can have. Sheila is one of the very few teachers I know that has had a successful teacher/student relationship with their own child. Alison Mittig Plemmons, four time USIR Champion, informed me... "My mom has always been extremely supportive in my dancing. Urging me to do nothing more than my very best because that was all I could do. I feel very fortunate to have had my dance teacher be my mother because we both knew our limits and at the same time we both would strive to do our best. I was never pressured to win, win, win. I was never pressured to practice. I was never pressured to dance. I love dancing very much . . . influenced by my mother's love and passion for this art. My mom taught me right from the beginning that dancing is for pleasure, fun, self discipline, and attaining goals; the healthy way that makes me love Highland dancing even more." In addition, she also produced several US Champions, but it was WE who had the extreme honor and privilege of being her students. Having a "Champion" has never been her goal. Her main objective was and still is, to do whatever she could in the student's best interest and for the love of dance. She had our respect as a teacher and our love as a family member. As Diane said, "She was more like a "big" sister with a yardstick!" On and off the teaching stand Sheila is one of the most honest, trustworthy, and caring people you will ever meet. Unselfishly she passed on her knowledge, never playing favorites, and never rejecting a student due to lack of ability. When I first began traveling to Scotland every summer to compete, it was Sheila that suggested and arranged for me to take lessons during my stay. She had no fears or insecurities about another teacher stepping in. If anything, she encouraged us to expand our wings and develop our own style. I asked some of her former students to share some of the unique sayings they remembered from class. In the reel when the dancers were standing too far apart she would say, "Scoot in closer you're spread out like a weeks washing." Spring up your dancing like " stiffy the goalie. "(soccer) The one saying we ALL remembered�. "I'm going to get my yard stick!" Winning Cowal in 1976 and again in 1977 are some of the best memories in my life. The most special moment was calling Sheila and telling her. I remember sitting in a phone booth making the call. Of course she had been sitting by her phone waiting on pins and needles. She asked. "Well? How did it go?" I replied, "OK", trying to hide my excitement. Her only concern was if I had fun and danced my best. When I finally broke down and told Sheila I had won both the Scottish Championship and Cowal Championship, the screams could be heard all over. Hearing her excitement and knowing how happy I made her was the highlight of my day. Not accepting the trophies on Cowal stage. Not parading Cowal field. But knowing how happy Sheila was and being able to give her back a little joy for all the years of happiness she had given me. By the time this article is printed, it will be time to celebrate Thanksgiving and Christmas. A time of year to celebrate the birth of Christ, be thankful for our blessings, and give thanks. As with past years I will celebrate knowing I have been truly blessed simply by having the opportunity to know and to have Sheila Mittig in my life."